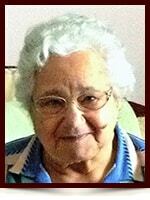 Maria Emilia Cordeiro - Edmonton's Burial & Cremation Professionals | Trinity Funeral Home Ltd.
On July 22, 2015 Mrs. Maria Cordeiro of Edmonton passed away peacefully at the age of 89 years. Left to cherish her memory are her three children: Jose (Maria dos Anjos), Margarida (Hildeberto) Ferreira and John (Conceicao); six grandchildren; five great-grandchildren as well as numerous relatives and many dear friends. She was predeceased by her husband Joao in 2014. So sorry for your loss!! Our prayers and thoughts are with you and your family. She is now in God’s home and looking down on her loved ones.